I have always wanted a strawberry patch of my very own! 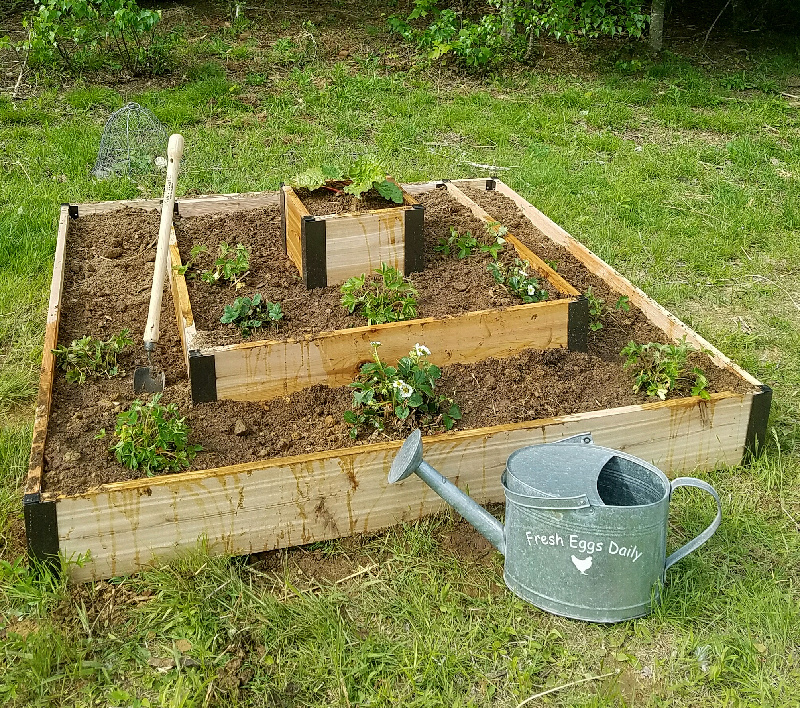 So finally, after living here in Maine for almost three years, I decided it was time to plant strawberries. I knew I wanted it to be a raised bed to keep the strawberries elevated a bit to deter the snowshoe rabbits, toads, snakes and of course the chickens who all love to nibble on the sweet ripe fruit. Strawberries also do well in containers and pots, or as edging along a flower bed. But I had other ideas for these strawberry plants. I also had been meaning to move the three rhubarb plants we inherited from our home's previous owners. For the last three years, the plants had been languishing, not really doing much, so I thought it couldn't hurt to transplant them and see if they liked a different spot of our yard better. When I was growing up in Massachusetts, both my Mom and grandmother grew rhubarb, and I remember grabbing a cup of sugar and sitting on a warm summer day in my grandmother's garden, dipping the end of a rhubarb stalk into the sugar and munching on it. Not the healthiest snack, but it sure was good! Fortunately, my palate has matured a bit as I've aged, but I still love rhubarb - these days I enjoy it in pies and jams, usually paired with strawberries. And it was as I was thinking about those recipes that I had a brainstorm! I was going to plant myself a strawberry rhubarb garden! Turns out that strawberries and rhubarb are actually good companion plants. They both are perennials, so they need a dedicated patch where the ground won't be tilled or turned over in the fall. They both like slightly acidic soil (5.5-6.5) with lots of organic matter mixed in for good drainage and they both benefit from the addition of manure (Hello, chickens! Hear that?). The both also like full sun for at least 6 hours a day. 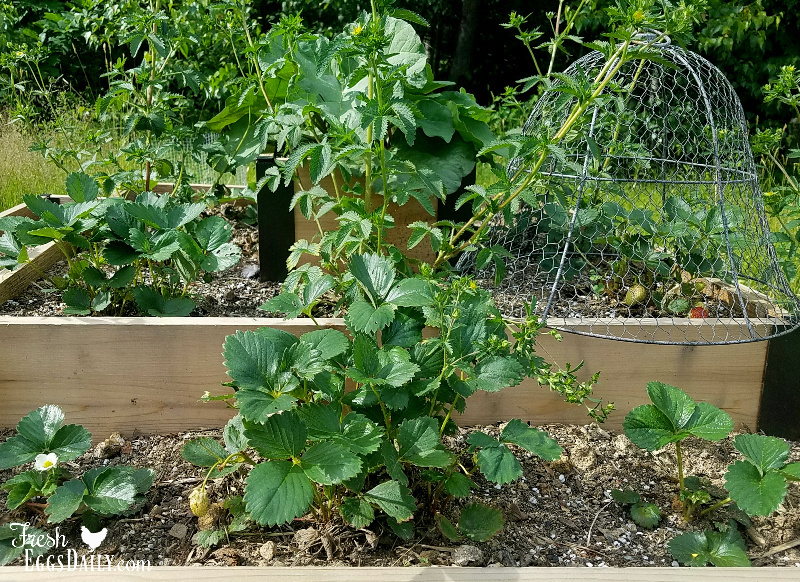 Keeping all this in mind, I decided to situate my strawberry rhubarb garden next to the chickens' herbs garden which is next to their coop. 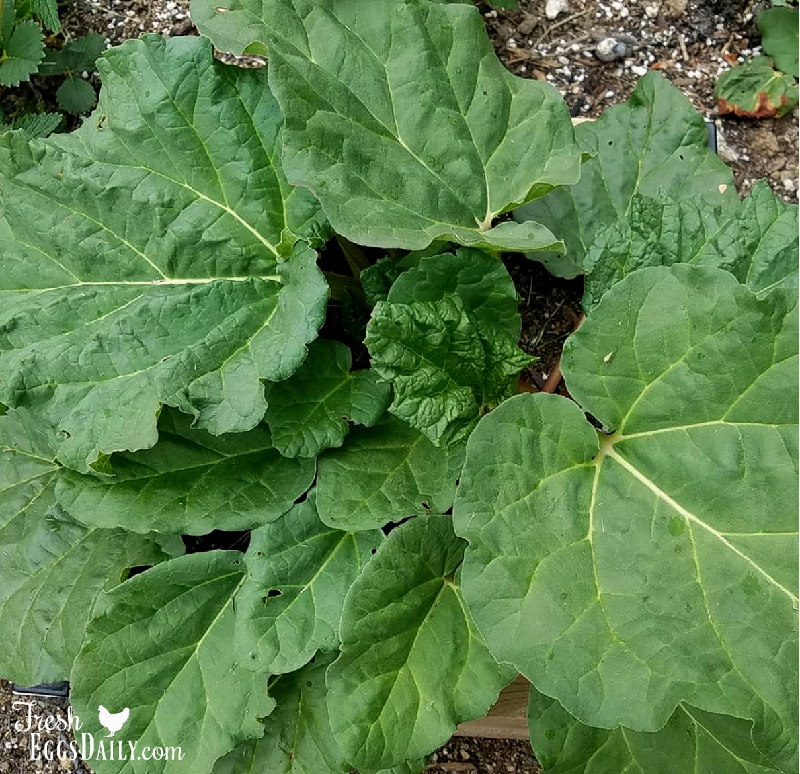 While rhubarb leaves are toxic to chickens (and humans for that matter! ), from past experience I knew the chickens would likely just ignore them with so much goodness to munch on in their herb garden and around the yard. 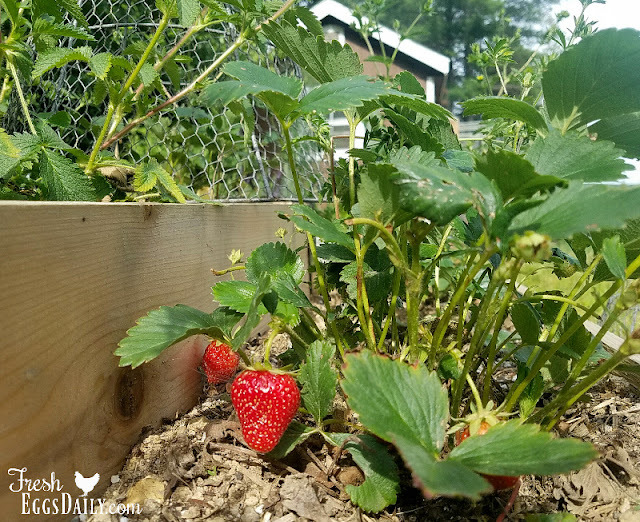 Strawberries are a favorite chicken treat however, so I figured I would need to cage the plants - at least when the berries were about ready to ripen - no matter where I planted them. Not a problem, I have a bunch of chicken wire cloches hanging around that I could put to good use! I was ready to get started. 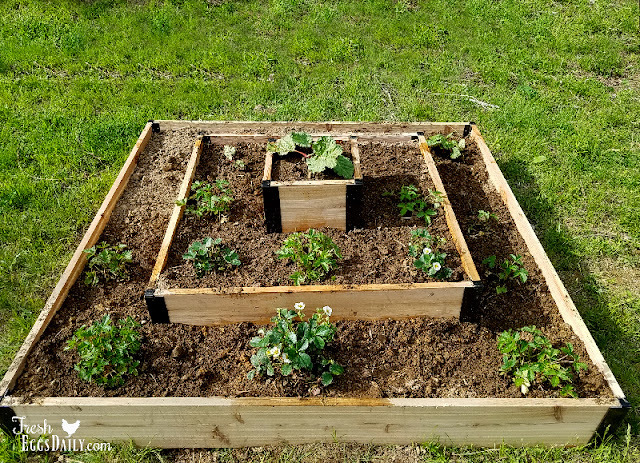 I found this great three-tiered garden from Gardeners Supply Company. It was going to be perfect for what I had in mind! After sending my husband out to get me a bucket (a tractor bucket, that is) full of dirt, I topped it off with some top soil and a healthy serving of composted chicken manure and then started planting. 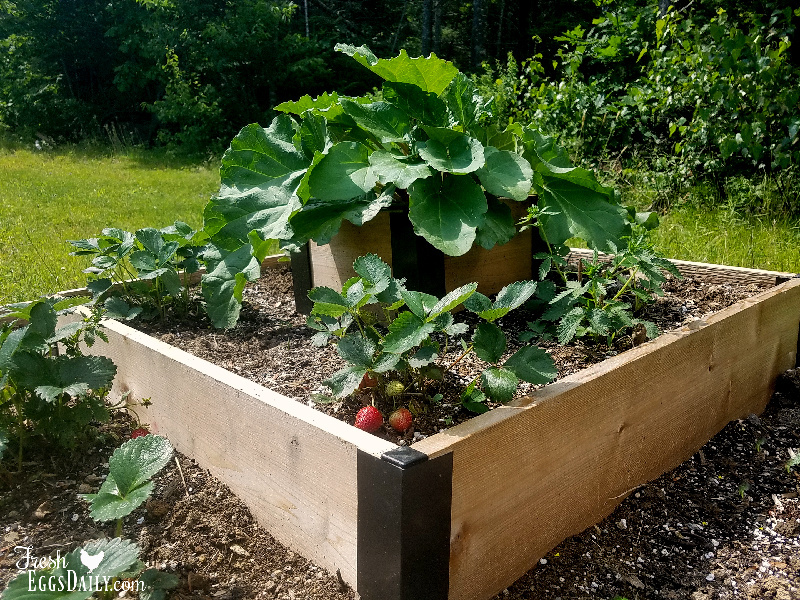 The strawberry plants went around the lower two tiers, with a rhubarb plant as an "anchor" in each back corner of the lower tier, and then the final rhubarb plant got the place of honor at the very top! When I was done planting, I mulched around the plants with straw. The straw will help the soil retain moisture and also keep the weeds down. 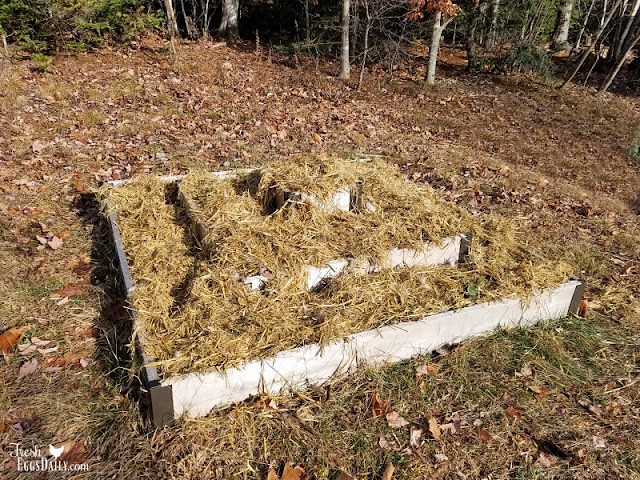 In the fall when I clean out my chicken coop, I'll add more mulch, several inches more, over the top of the plants to help protect them from our cold Maine winter. 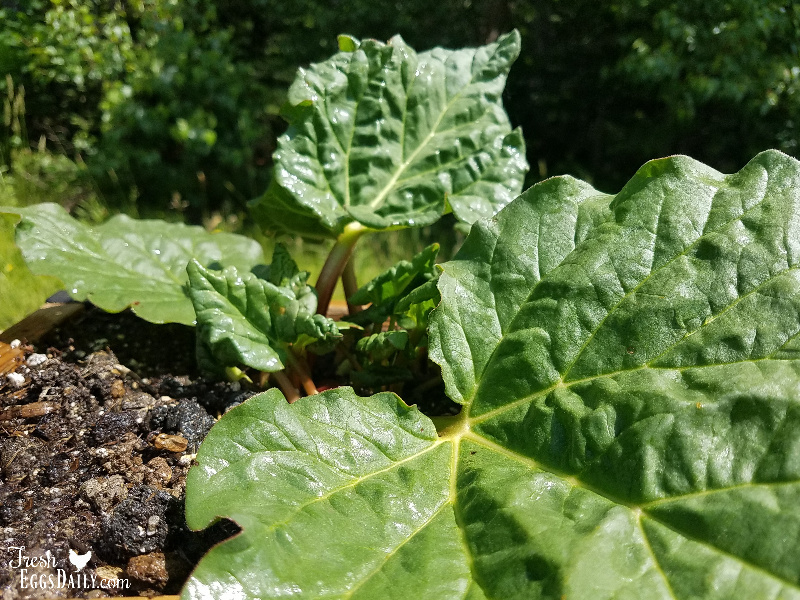 It's only been a few weeks since I planted everything, but to my surprise, the rhubarb is flourishing and I've already harvested a few stalks. I resisted the urge to dip one into a cup of sugar, but I sure was tempted! 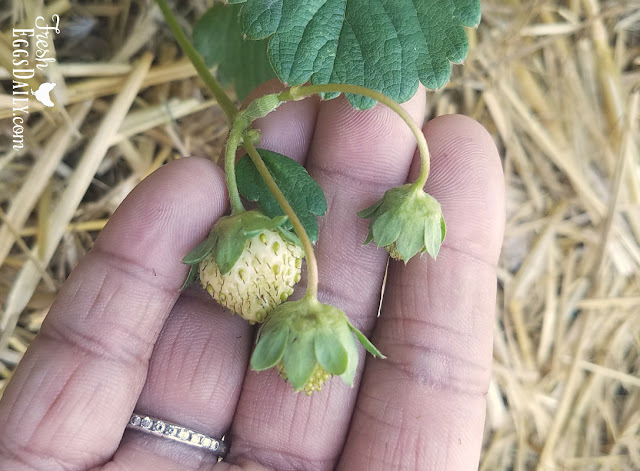 Although the first year, strawberry plants should be allowed to concentrate on growing strong deep roots and prohibited from bearing fruit (by removing the flowers), but I just couldn't resist and did let a few strawberries ripen! And they were delicious! I'm really excited for next year when I'm sure the garden will produce plenty of both rhubarb and strawberries for me to make that strawberry rhubarb pie I've been dying for! There are various types of strawberries that you can plant - spring bearing, everbearing, day neutral, etc. Some bear fruit once a season, others throughout the season. Some varieties put out longer runners, others not so much. So do some reading and research into the type you want to plant. 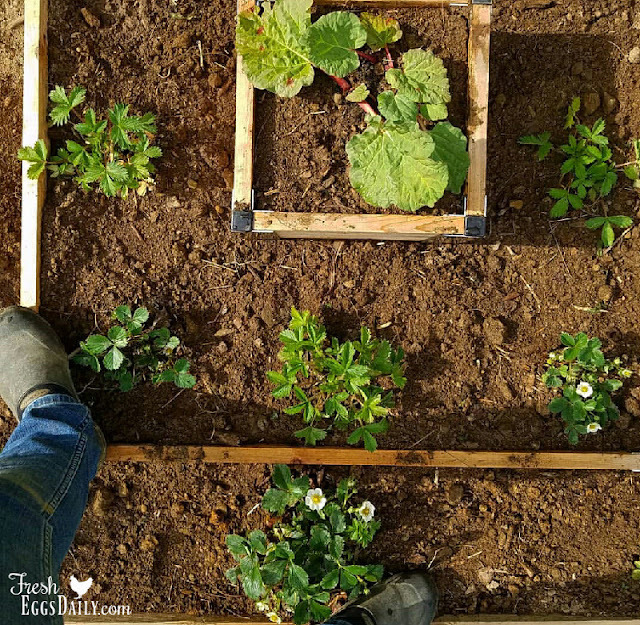 You'll plant your strawberries as small plants from your local garden center or shipped to your door in early spring. They should be lightly fertilized (nothing chemical please! that's what chicken manure is for!) and planted in rows (about 2 feet apart) or hills (1 foot apart). You should see new growth in about a month and as mentioned above, the first season you want to watch for blossoms and remove them to prevent the plants from bearing fruit and instead focus on growing a good root system. It's hard, I know, but trust me, you'll have far better future harvests if you do. 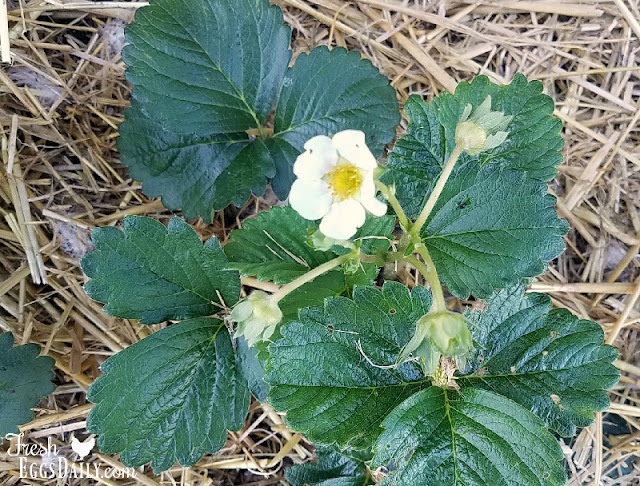 Strawberries need about an inch of water per week, so if it doesn't rain, don't forget to water your plants! 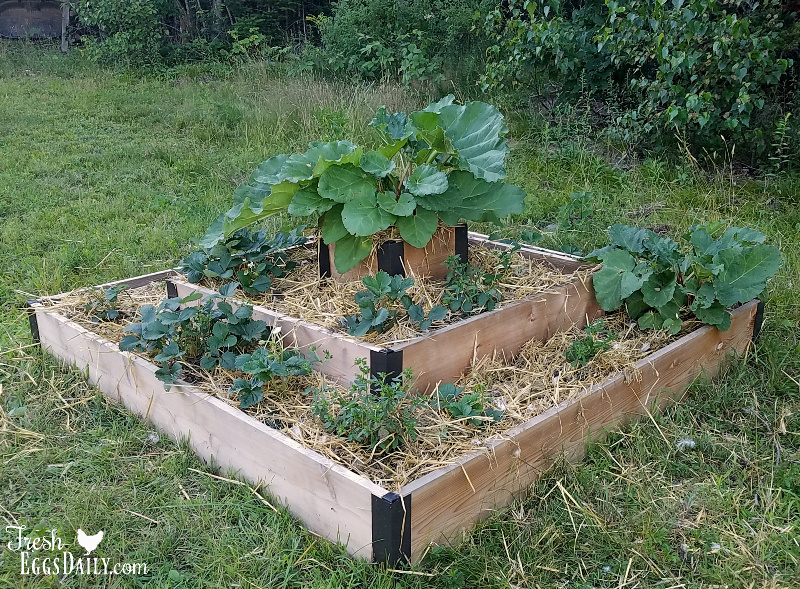 Mulching around the plants with straw as I mentioned will help retain soil moisture and also keep the future berries from sitting on the dirt. It can also deter bugs that live in the ground from eating your berries. Harvest berries when they are large and bright red. by breaking the stem just above the cap. 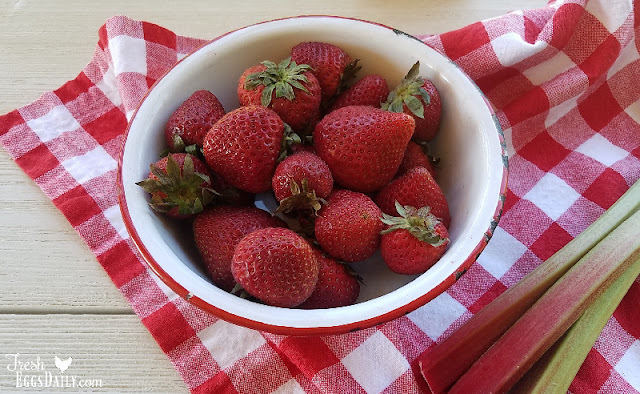 Strawberries don't continue to ripen after being picked, so be sure the entire berry is red and there are not white spots on the surface. Strawberries are the only berry with their seeds on the outside. The seeds germinate from light not moisture so wild berries grow easily from seeds dropped by wild birds. American Indians made corn bread studded with wild strawberries. This evolved into strawberry shortcake. 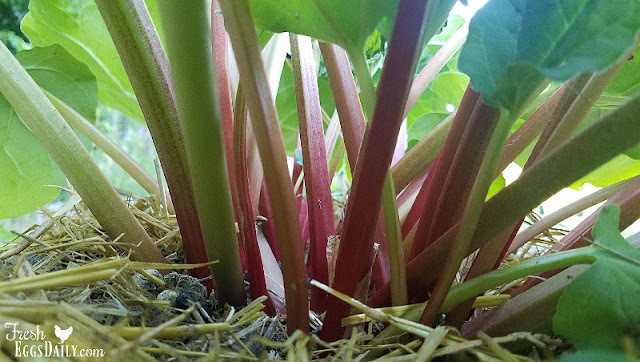 Rhubarb is most easily grown from "crowns" you purchase or by divided an existing plant in the early spring, although it can be grown from seed as well. Rhubarb is a heavy feeder, meaning it needs soil with lots of nutrients in it, so you will want to nourish the soil around your rhubarb plants (and in the hole in which you plant the crowns) with plenty of chicken manure (aged droppings only, remember that "hot" manure can not only burn plants but contain pathogens like E.coli or salmonella). Harvest the stalks when they're 12-18" long and have turned reddish. Twist and pull the stalk or cut at the base with shears. Remove the leaves and tough base end. (You can lay the leaves down on the ground around the base of your rhubarb plants to help keep weeds back and to act as fertilizer as they decompose back into the soil.) Never harvest more than half of the plant to allow it to continue growing. In the fall, cut back your rhubarb plants to the crown once the leaves die back. Rhubarb also likes to be mulched with straw. Just an inch or two in the growing season and then at least 4" over the entire crown in the winter. The soiled straw bedding from your chicken coop makes perfect mulch because the chicken manure and feathers in the bedding will break down over the winter and provide the soil loads of nutrients for your rhubarb come spring. Rhubarb needs frozen ground in the winter to grow during the warm months. The word "rhubarb" means "root of the barbarians" because the Romans considered those who ate it barbaric. Rhubarb has been used for medicinal purposes since 1700 B.C. by the Chinese. 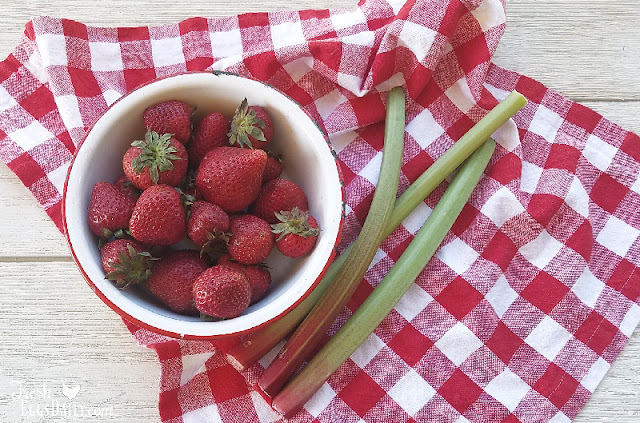 Both strawberries and rhubarb can be eaten fresh or frozen for later use. Just brush any dirt off the berries gently with your fingers, then hull the fruit (remove the green tops and remember to feed them to your chickens) and then freeze them either whole or sliced. The rhubarb should rinsed in cool water and then cut into 1/2" slices and frozen. It can be blanched to retain it's color, but blanching isn't necessary prior to freezing. Join me here Facebook | Twitter | Instagram | YouTube| Subscribe ©2018 by Fresh Eggs Daily, Inc. All rights reserved.